It’s dishes like this that remind me why I love beef. So tender, so flavorful — sweet and a little smoky, all anchored by the umami flavor of the steak. It’s amazing. For a perfect meal, all this needs is a little side salad (maybe a classic iceberg with a drizzle of blue cheese dressing) and perhaps some corn on the cob. One note: I cooked up 12 oz. and felt 3, 4 oz. servings were quite nice. Using this math, you could get 6 servings, not 4 as the recipe suggests, out of 24 oz. of steak. Having said that, Shane ate two servings. In a resealable plastic bag or shallow dish, combine vinegar, sugar, garlic, rosemary, 1 teaspoon coarse salt, and 1/2 teaspoon pepper. Pierce meat all over with a fork; add to marinade, and turn to coat. Let marinate at room temperature at least 15 minutes, or cover and refrigerate up to 1 day. Heat grill to high; oil grates. 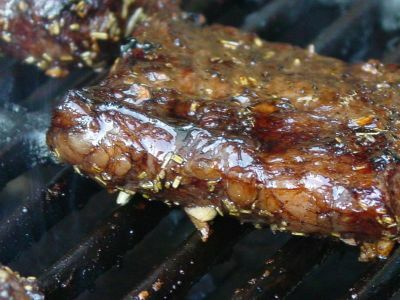 Remove steaks from marinade, allowing excess to drip off. Grill steaks 2 to 4 minutes per side for medium-rare. Transfer to a plate; cover loosely with aluminum foil, and let rest 5 minutes. Serves 4.